A great way to encourage young cooks! Divided into 2 sections (savoury and sweet) for storing up to 40 recipes within wipe-clean plastic wallets. 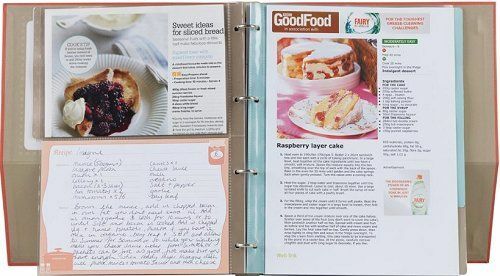 Each section includes a couple of recipes to get the children started together with plenty of blank recipe cards for writing out their own favourite dishes. The file also comes with 3 full pages of stickers for grading recipe choices and for decorating their file. A built-in wipe clean stand allows the file to sit securely on the work-top.